Chase International’s Chase Donaldson (far left) and Otis McAllister’s Dan Bush (far right) join Greg Paradies (center) and representatives of JFKIAT and Lagardé at the official opening of the So Chocolate! concept at JFK Terminal 4. 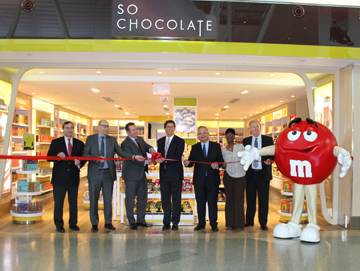 North American airport retailer Paradies Lagardère has launched two new retail concepts at John F. Kennedy International Airport’s Terminal 4: exclusive confectionery brand So Chocolate! and sports apparel brand The Scoreboard. Both stores were officially introduced during a ribbon cutting ceremony on February 2, 2016. The two highly-successful proprietary brands are a first for a U.S. airport. The 1,250-square-foot store So Chocolate!, located in the east retail lounge of Terminal 4, offers a wide assortment of candies and sweets. The Scoreboard offers an array of authentic apparel and accessories from all major U.S. professional sport leagues. The store includes an assortment of Giants, Jets, Yankees, Mets, Rangers, Islanders, Devils, Nets, Knicks, NY Red Bulls and New York City Football Club merchandise, as well as products related to the hottest sports trends. “Both So Chocolate! and The Scoreboard will resonate with travelers visiting the airport, and complement our existing brands. We look forward to continuing our partnership with Terminal 4 and introducing exciting new brands to Terminal 4 travelers for many years to come,” said Gregg Paradies, president and CEO at Paradies Lagardère. Lagardé acquired family-owned Paradies for US$530 million in August 2015, and Greg Paradies, President & CEO of Paradies, remains at the helm of the new company. In April of last year, Lagardé’s LS Travel Retail North America division acquired the assets of Saveria USA, Inc. which gave them the operation of 20,000 square-feet of prime specialty retail space at JFK T4. The terminal handled 19.5 million travelers last year. The company already was operating numerous stores in the terminal, including the high-end Longchamp, Hugo Boss, Guess, and Swarovski boutiques. Paradies Lagardère’s will next be opening The Fashion Place, a 3,000 square foot shop-in-shop offering a wide assortment of fashion apparel and accessories, in May. “Terminal 4 strives to create a superior passenger experience for travelers, and – as such – our terminal features an unparalleled selection of commercial and retail offerings,” said Gert-Jan de Graaff, president and CEO of JFKIAT – the management company operating Terminal 4.